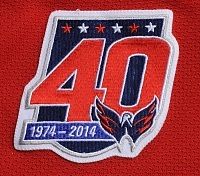 Patches - Winter Classic - On January 1, 2011, the Capitals Winter Classic jerseys had the 2011 Winter Classic patch on the shoulder. Notes - Four sets of Winter Classic jerseys were worn - one in each period and one in warmups. Notes - The Capitals wore their home red jerseys on the road at Philly on Dec 21. They wore their road white jerseys at home on Feb. 5.